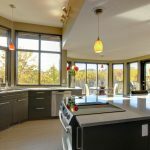 New Kitchen Design Tips & Tricks | Bow Valley Kitchens Ltd. Designing a new kitchen fully empowers homeowners to create their dream kitchen. Custom kitchens can incorporate several design ideas into a single or blended custom kitchen style. 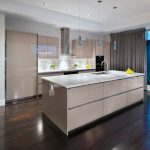 The selection of your kitchen cabinets, appliances, paints, flooring, appliances, and other facets are all incorporated when designing a custom kitchen. Don’t let the kitchen design process become stressful or disheartening. Consulting with a kitchen professional to help finalize your ideas or existing designs, can help make the process more streamlined and can ensure your final design is the kitchen you always dreamed of. Designing a new kitchen should aim for an overall feel and atmosphere, accomplished through custom design and the materials used. These 7 new kitchen design tips can help get you started when considering different aspects of you upcoming kitchen. Your kitchen style can be as pure or as blended as you desire. In regards to rental or investment properties, a kitchen design should showcase a practical, clean and safe design. Though when you are crafting the kitchen of your dreams, do not be afraid to push the boundaries of your kitchen style. If you are aiming for a “modern” style but truly prefer raised cabinet panels and framed cabinet doors, go with the doors you want rather than a traditional modern, flat-panel door. Utilizing the design elements that you personally find most appealing will lead to the most satisfying kitchen space possible. Your kitchen should match the rest of your home, which has been built through your character and preferences. Kitchen spaces need to do more than just look great, a kitchen needs to function in a way that accommodates the residents adhering to their cooking and entertaining needs. The layout of your new kitchen needs to allow for proper flow and access to the focal points. Easy island, fridge and stovetop access are three key considerations. Consider how your dishwasher door will block a pathway, or if you will have enough storage space for all your dishes and kitchenware. Make sure your new kitchen design is as functional as it is attractive. The design process is where you have the opportunity to analyze absolutely everything you could want or need from a kitchen. You have the power to be different and to craft a design that is suited to the needs of you and your family. Your appliances, flooring, cabinetry, lighting, paints, materials and much more can be hand selected by you to come together in the perfect kitchen. In the pursuit of large sinks and stovetops, homeowners can often sacrifice their countertop space. An abundance of specialty appliances a large cutting block, napkin baskets, ornaments and other pieces can begin to clutter the counters. Ample countertop space is key to organization and food preparation. Make sure to leave at least 9 inches of countertop space between your major appliances and on either side of you cooktop. Don’t sacrifice the functionality of your kitchen by limiting your countertop space. Your new kitchen will be full of several materials and appliances that you are able to choose. This can mean selecting the different types of tile materials or wood materials for your flooring and backsplash. Also, consider what appliances you want as well and their location in the kitchen. Considerations of double sink or ovens can increase kitchen functionality and efficiency. Materials like marble, stainless steel and glass look wonderful, though can easily, scratch, stain or crack, which makes them ideal for a more mature household. Granite, ceramic tiles, and plastics can be better for young children as they are more durable and require less maintenance. Kitchens need to store a number of items. Daily dishes, luxury dishes, specialty appliances; cutlery, towels, soaps among other kitchenware need to fit into a single room. When designing a kitchen space, make sure you plan for your storage needs. Drawers can offer up to 30% more storage space than shelves, though shelves can help keep items more organized. Custom storage appliances like door shelving or a Lazy Susan spin top can be used to increase the storage capacity of the kitchen. Consider how bright you want the kitchen to be is when designing the lighting, and also think about the rooms natural light. Spaces with white cabinetry and large windows may need fewer lights or dimmer switches, compared to spaces that are earth-toned or feature rustic cabinets. LED lighting in the cabinetry can brighten up any kitchen space. Angled lighting to combat shadows can be used to create sufficient area lighting as simple overhead installations may not provide the necessary lighting.